Cut butter into flour mixture with a pastry blender until crumbly and mixture resembles small peas. Freeze 5 minutes. 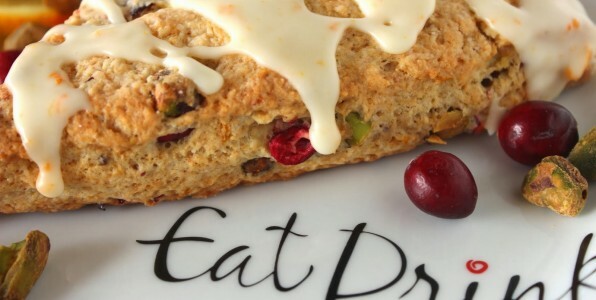 Add 3/4 cup plus 2 tablespoons cream, cranberries, and pistachios, stirring just until dry ingredients are moistened. Turn dough out onto wax paper; gently press or pat dough into a 7-inch round (mixture will be crumbly). Cut round into 8 wedges. Place wedges 2 inches apart on a lightly greased baking sheet. Brush tops of wedges with remaining 2 tablespoons cream just until moistened. Bake at 450° for 13 to 15 minutes or until golden.